Witches have their wands. Wands are nice, easy to transport, somewhat easy to come by. Wizards though, they've got staffs. The timeless ones do at least. You wouldn't see Gandalf the Grey or Merlin sporting a little wand, oh no. The powerful wizards that fight underground demons need some hefty equipment and it has to look pretty spiffy too. There's no doubt that this wizard staff packs a punch. We're guessing it was crafted by the elves but we can't promise anything. What we do know is it's bound to get you some respect at the upcoming wizard convention. The purple orb is eye-catching and mysterious, who knows what sort of power lies in that cloudy marble. 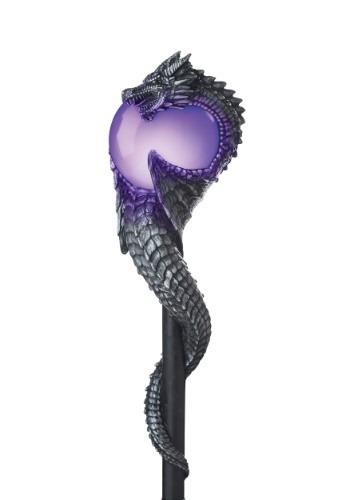 A powerful dragon curls itself around the orb, protecting the magic inside. We don't know what kind of magic you'll whip up with this staff but one thing's for sure, this staff sure beats a measly wand. Shipment was quick, and the "assembly" is easy. The poles are disconnected in three parts, but intact by a tension cord inside, so it's just a matter of aligning the three pieces together, and you got your staff! The size of the globe is quite large, so it stands out. The dragon is the best part of the staff, of course. The detail is really nice, and the dragon looks cool wrapped around the globe. The globe does light up and flicker, but it's via the push of a small red button. The only thing I don't care for is that the flickering of the globe only last about 10 seconds, then it shuts off. They should've had a toggle option to keep the globe lit and flickering. Who wants to hafta push a button over and over all night? All in all, a cool-looking staff! Love the staff. I actually took out the purple globe and light. The light doesn't stay on and my costume didnt have purple in it. No other company has this kind of staff. Its is a very sturdy staff compared to others. Durability is a 5 star.